Last week I was standing under a blue sky in a bleakly beautiful landscape. It was vivid with an unlikely marriage of green and orange, the brief surge of summer growth giving way to the rustiness of autumn. Bright white snow lay off to my right, the stubborn remnants of winter storms hinting at the true nature of the place. 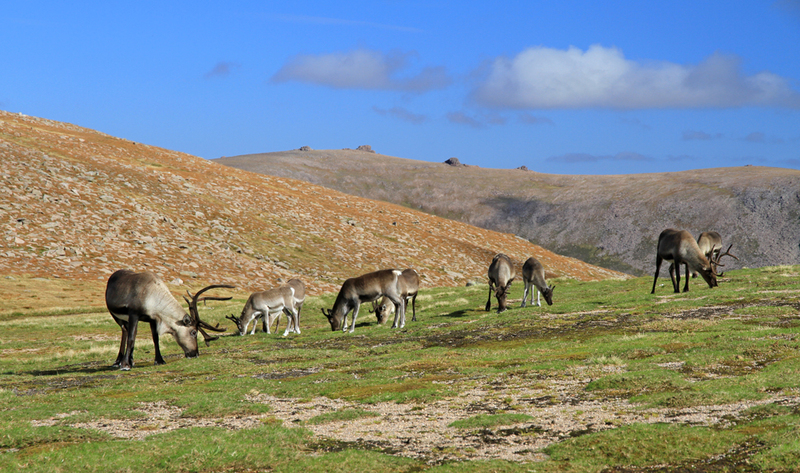 And just beyond that, not ten metres from me, a dozen or so reindeer grazed peacefully under a warm sun. I sat down on a rock and immersed myself in the timeless scene before me, alone with the reindeer in the wilderness. It was utterly quiet but for the click of the reindeers’ feet. It was otherworldly, but sublime. It was the Arctic, as clear as day. But of course, I knew it wasn’t. This was Scotland. Coire Domhain in the Cairngorms to be precise, a mere stone’s throw from the bustling car park at Coire Cas near Aviemore. If I’d walked just 1km north the ski paraphernalia would have come into view and the remote, arctic illusion would be shattered completely. Thinking about it now, it’s surprising how that illusion was even possible. Massive as the Cairngorms might seem in the context of these crowded islands, they still seem an unlikely place to find reindeer given the pressures of suitable habitat, the considerable potential for human disturbance, and the glaring fact that wild reindeer are extinct in this country. 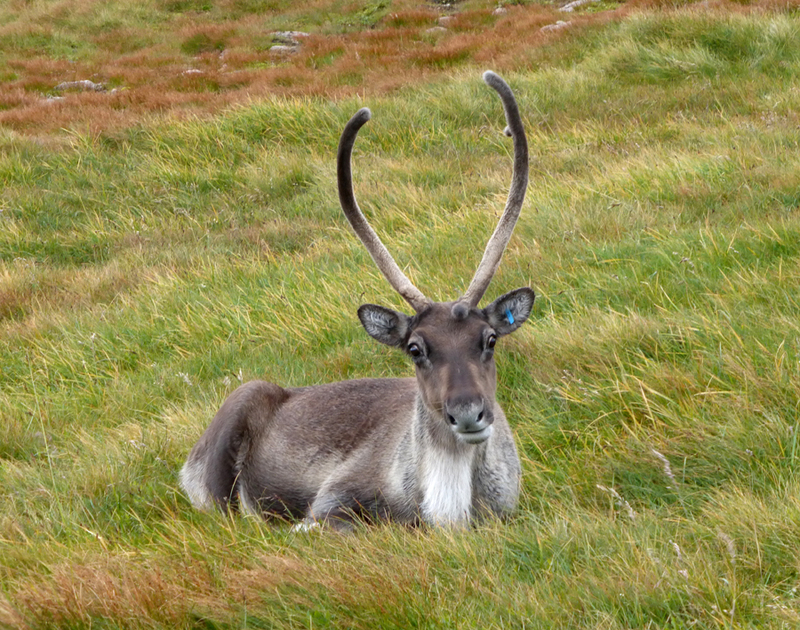 We know reindeer used to live here because plenty of their remains have been recovered from all across Scotland. But exactly when (and how) they went extinct is open to debate. There’s a school of thought that puts their demise some time in the 12th or 13th Centuries, based largely on the fact that an Orcadian saga (the Orkneyinga) from that time makes reference to reindeer being hunted in Caithness. Others maintain that carbon dating of the remains of Scottish reindeer shows that none are younger than around 8300 years. But everyone can at least agree that they were indeed here in our post-glacial past and at some point, whether because of climatic changes, loss of habitat or human hunting……they died out. One might assume that because they died out it means they don’t belong or can’t thrive here. Well, that is partially true in so much as we have few places in Scotland that can be considered ideal reindeer habitat. Though we have plenty of wide open spaces that accommodate hundreds of thousands of red deer, the climate and habitat isn’t necessarily right for reindeer. The Cairngorms are perhaps the only place in Scotland (and indeed Britain) that qualify. As the largest area of land over 3000ft the range is the closest thing we have to an arctic environment, and is therefore the closest thing we have to the places in which reindeer thrive. Scandinavia, Siberia, Arctic Canada, Greenland, Alaska etc. The heart of the Cairngorms is far enough from the coast to be drier and colder in winter, and the long summer daylight means there’s an abundance of the kind of grazing reindeer thrive on. Grasses, sedges and fungi. A similar abundance of lichens in the Cairngorms offers them meagre but valuable sustenance in winter. Reindeer are the only deer species to be found in the Arctic. This is because they have special adaptations that enable them to survive harsh winter conditions. Firstly, they have two layers of fur. A dense woolly under-layer, on top of which is a layer of longer, hollow hairs. As in polar bears these provide incredible insulation, such that when a reindeer lies down in snow, the snow beneath them doesn’t melt. Even their feet and hooves are covered in hair that minimises heat loss from the extremities. But they’re also able to regulate their body temperature by diverting heat away from their legs and into their bodies. Reindeer hooves are much broader than in other deer species. They act as natural snowshoes, spreading their weight more evenly on the snow’s surface and stopping their legs from sinking. These broad feet are also superb for digging through deep snow to reach the food underneath. Most curiously of all, a tendon in their feet involuntarily rubs over the bone every time they take a step, producing a surprisingly loud clicking noise. And it really is loud when you’re stood among them, sounding a bit like hail on a hard surface. It’s believed that reindeer listen for these clicks when the herd is marching face-first into a blizzard. Heads down and with visibility near zero, the clicking means the herd can still stay together. Crucially, in winter they have slow metabolisms and don’t move much. They don’t need to range far anyway, as they can find food under the snow, are kept warm by their thick coats and by the fat reserves they built up during the summer grazing. Put simply, reindeer are perfectly designed for the worst of Cairngorm weather. Where did the Cairngorm reindeer come from? They were reintroduced from Scandinavia in the 1950s, by which time there had already been numerous failed attempts to do so over the previous centuries, notably by the Duke of Atholl in the 1790s. He imported 14 animals from Russia but according to the Chronicles of the Atholl and Tulliebardine Families, only three reindeer reached their final destination. The remainder died on the long voyage to Scotland or on the road journey from Leith. Reindeer fortunes changed, however, in 1947 when Mikel Utsi, a Sami reindeer herder, visited Scotland on holiday. He was immediately struck at the resemblance the Cairngorms bore to his native Sweden, only the reindeer were missing. He and his wife, Ethel Lindgren, therefore decided to bring a small herd over from Scandinavia as an experiment to show that reindeer could survive and thrive in the Cairngorms. The project started small in 1952, in enclosures near Loch Morlich. 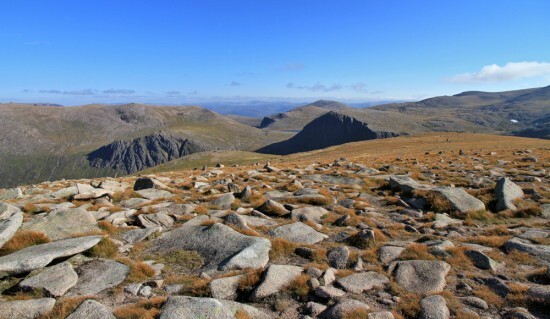 Then in 1953 the Forestry Commission granted them grazing pasture below the Northern Coires, before extending it up to the top of Cairn Gorm and adjacent summits the following year. Today, the herd numbers between 130 and 150 and is divided between enclosures near the Sugar Bowl car park at Glenmore, the Glenlivet estate over towards Cromdale, and the open Cairngorms themselves. All of the reindeer take turns free-roaming either in the Cairngorms or Cromdale, such that most of the animals spend much of their year outwith enclosures on the open hill. They’re not wild in the truest sense perhaps, indeed every single one has a name, but they’re arguably the next best thing. They’re left to their own devices as their natural life cycle dictates, eating what they want, roaming where they want, with human handling restricted to a minimum at key times of the year. Namely mating, calving, and supplementary feeding if required. The reindeer would probably survive by themselves in limited numbers, but just like on a farm, management means the small herd can be kept in good health with a good degree of genetic diversity. The males start growing their antlers in the spring so that they’re fully grown by the time the rut (mating) arrives in autumn. In the wild they would use their antlers to fight for dominance over a harem of females, but in the Cairngorms the bulls are carefully separated and allocated with a field of females each. When the rut is over the males naturally cast their antlers, and new ones will start growing when winter is over. Deer antler is made of bone and is therefore extremely hard, but while it is growing it requires a blood supply all the way to the tips, and is vulnerable to damage. Protective velvet coats the antlers while they are growing, and when fully grown the blood supply is cut off, the velvet dries and it starts to peel away. 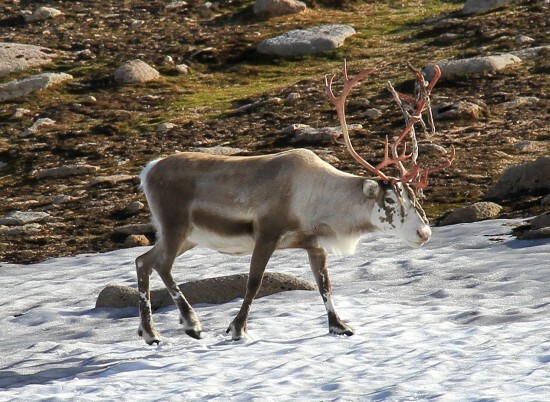 This growing and shedding of antlers is something common to the males of most species of deer, but reindeer are the only species where the female grows antlers too. She will cast them later than the male, in spring before the calves are born, and they will be fully grown again ready for the following winter. The females need their antlers to fight for food and will dominate the antler-less males as a result. A sensible strategy when food is in short supply and you have an unborn calf to feed. Most of the reindeer spend the whole winter on the open hill, with the exception of a few that become star attractions all across the UK, pulling sleighs in big parades in the run up to Christmas. Once their duties are fulfilled they return to the open hill. Mothers return or are herded back to the enclosures in April and the calves are born in May. The females and new calves are quickly taken back onto the hill and won’t be seen again until autumn, when they return for the rut. 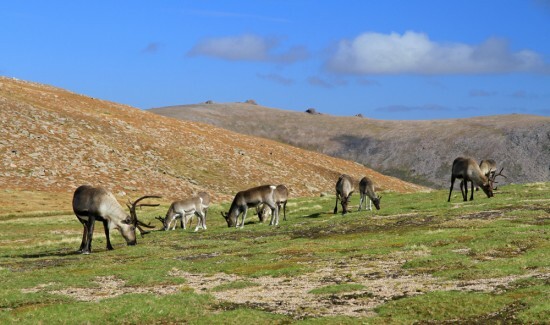 During summer they graze freely in the hills, making good use of the new vegetation growth and staying close to snow patches in an effort to escape the biting insects. And that’s exactly what I found them doing last week as I walked back to Coire Cas from Loch Avon. It wasn’t the first time I’d seen them by any means, but as the only free-roaming reindeer herd in Britain you never quite know where in the Cairngorms you’re going to encounter them next. One thing is certain, however. Wherever you see them, the encounter is always a memorable highlight of a walk. It doesn’t matter that they’re semi-domesticated, they’re still a glimpse into Scotland’s past. And who knows? In the ongoing debate about rewilding, they’re perhaps a glimpse into its future too. Please note – though semi-domesticated and famously placid, reindeer are still wild animals that can act defensively and aggressively if threatened. Take special care around them at all times but especially when they have calves or during the autumn rut.